Studies done by ENERGY STAR have found that commercial buildings waste up to one-third of the energy they use. Most of this waste is in the form of inefficient heating, cooling, and lighting. Poor control over power distribution contributes to the problem, as do old or dirty condenser coils and air ducts. Given that commercial buildings’ major selling point is their greater efficiency, relative to residential or industrial properties, tightening up the energy profile of the headquarters office is one of the most productive investments a company can make. Workplace safety regulations mandate that workspaces should be adequately illuminated for employees to do their jobs, but within that requirement, there is almost always room for improvement. Energy-efficient, preferably ENERGY STAR-certified, light bulbs use significantly less electricity than incandescent or older compact fluorescent equivalents. Occupancy sensors, which only light a room when a person walks into it, are another way of preventing unnecessary loss through over-lighting empty rooms. Plug load controls switch off the flow of electricity to “standby” devices. By interrupting power to cell phones and other rechargeable items once their batteries are topped off, these convenient plug-in accessories may save up to 25% of the energy wasted in a commercial building. Sealing off the interior of a building that contains dozens or hundreds of people is a potential health risk, but leaving the windows open to create unlimited air flow is typically a waste of heating and cooling energy. 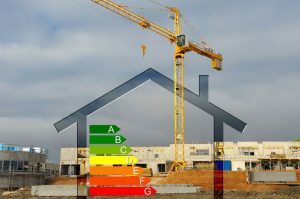 With a modern demand-controlled ventilation system installed to open and close exterior ports, ideally connected to a CO2 sensor, commercial buildings can find the sweet spot between unhealthy and inefficient extremes. HVAC systems pull most of the power a commercial building uses, and regular maintenance to these can save the lion’s share of the energy budget. Periodic inspections of air conditioner pumps and coils are essential for cleaning away the dirt and cobwebs that sap system efficiency, while close monitoring with a digital meter can track usage patterns and help find leaks in pipes and valves. Regardless of how good a building’s HVAC system is, poor insulation creates gaps which building air can escape, lowering efficiency. Regular inspections and upgrades of a building’s insulation, including new weather-stripping, can save the loss of warm or cold air from a commercial space. Where it comes to saving energy in a commercial building, every little bit helps. By cleaning and maintaining the HVAC system, upgrading the lights to energy-efficient standards and making use of a few smart technologies, almost any office property can improve its energy use, lower its environmental footprint, and save money that is wasted through inefficiency. For more energy efficient tips, contact USI online to find a branch near you. USI believes in excellence in every step of the process and ensures timely completion and quality of service, time after time.